The Beast and the Lion: issues of transcendence in the poetry of Yeats and Iqbal (2007) was published by Iqbal Academy Pakistan. It was one of my earliest attempts to implement the Iqbalian framework for a comparative study of literature after reconstructing that framework in The Republic of Rumi: a Novel of Reality (2007). 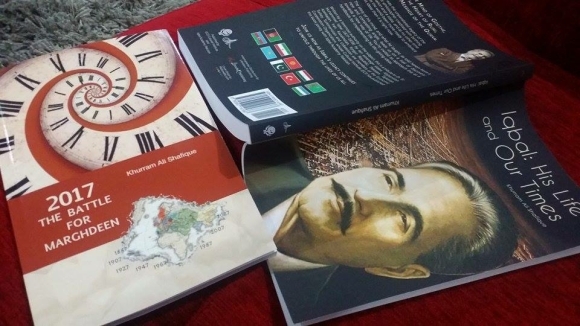 It received much praise from some eminent scholars at that time due to its fresh approach but I would very much like to revise it some time soon, especially to make it non-judgmental towards poets whose worldviews differed from that of Iqbal (such as W. B. Yeats). Are we living in good times or bad? How do we explain the fact that the vision described by Yeats of a rough beast slouching towards Bethlehem in the poem ‘The Second Coming’ was also sighted by Iqbal a dozen years before and described in an equally apocalyptic poem? Will be reawakened, so have I heard from angels. It is obvious that both poets were talking about the same thing: a lion with human attributes, the backdrop of the desert, a threat for the dominant world civilization, a reawakening of some sort, and a supernatural source of information (angels in the case of Iqbal and Spiritus Mundi in the case of Yeats). The failing of the current approaches in literary criticism become evident from the fact that this very obvious similarity has never been noticed, not even in Pakistan where many educated people are familiar with both poems. The comparison becomes crucially important when we notice that the responses of Yeats and Iqbal to their common vision were exactly opposite: what was a good omen to one was a threat to the other.